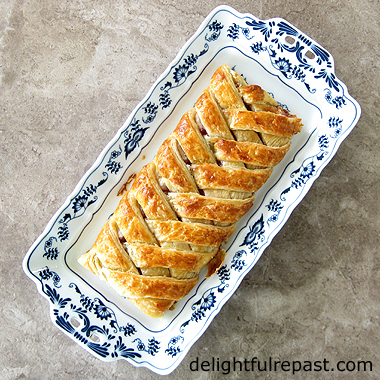 Raspberry Danish Braid popped into my head when I was organizing my freezer and saw that I still had a piece of croissant dough in there. 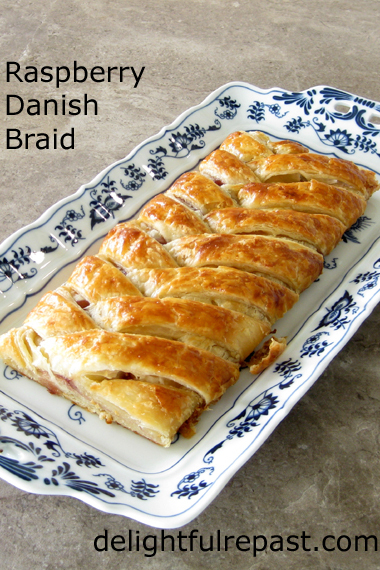 Of course, you can also make this braid with my Easy Danish Dough or my Ruff Puff - Quick Puff Pastry. Or even frozen puff pastry. But if you’d like to make it with croissant dough, here’s How to Make Croissants – A Tutorial. The recipe makes enough dough for three braids, but I usually just make one at a time, using a third of the dough. You can use all sorts of things for the filling, but I’ve found a mere 5 tablespoons of raspberry jam works beautifully and is quick and easy. The finished braid is longer than my longest rectangular platters, so the ends are cut off in the photos. Also, I did not put a glaze on top of the braid pictured as I didn't want the added sweetness, but you might want to add it. It's been a bit hectic this week, so this wouldn't have been on the menu if not for my secret stash of dough in the freezer. I tell you, always always always make more dough than you need and freeze it in tidy batches. It's great to be able to whip out a special homemade treat with practically zero effort on a busy day! 3 Line a heavy-duty half sheet pan with parchment paper. 4 On lightly floured surface, roll the dough into a neat 15x12-inch rectangle about 1/8 inch thick. With a short end of dough in front of you, lightly mark vertical thirds in the dough (with something like ruler or dull knife). Using a plastic pizza cutter, cut off the top two corners and cut slanted strips in the side sections. Tip: Don't make yourself crazy measuring the strips and getting them perfect. I just eyeballed it and it came out fine. 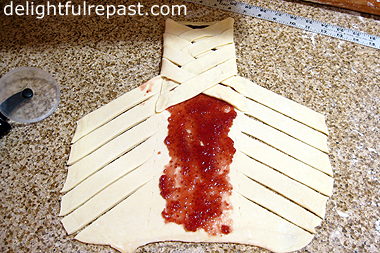 5 With small offset spatula, spread the jam over the center third of the dough. 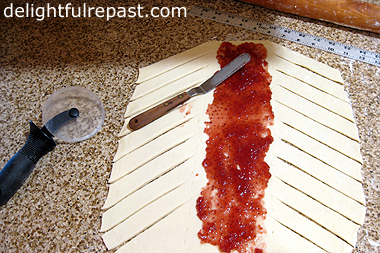 Fold the strips over the center, alternating from side to side. Place on parchment-lined half sheet pan. 6 Set the baking sheet in the cold oven and place a pan of boiling water (just 3 or 4 cups) on the bottom of the oven. This will keep the braid from drying out. Let rise until puffy, about 2 to 3, even 3 1/2 hours. Be sure to take it out before you preheat the oven! OR If you have a half sheet pan with a lid and 4 little cups of some sort (these are 1.5 inch tall 2.5-ounce stainless steel sauce cups my mother got at a restaurant supply store decades ago), fill cups with boiling water and set them in the corners of the pan and put the lid on. Doesn't matter that the water cools off, it's just there to get some moisture, not heat, around the rising dough. 7 Preheat oven to 450F/230C/Gas8. In small bowl, whisk together the egg wash. Brush the braid with egg wash. As soon as you put the pan in the oven, reduce heat to 400F/205C/Gas6. Bake for about 20 minutes, until deep golden brown. 8 Allow to cool for 10 minutes before glazing. Whisk together the glaze and drizzle over the warm, not hot, braid. Serve warm or room temperature. Stamped shortbread cookies may not actually taste better than unstamped cookies, but it seems like they do! And there are so many occasions that call for that extra little effort in the cookie department: weddings, showers, parties, afternoon tea. And a box of stamped cookies, along with the stamp, makes a wonderful host/ess gift. 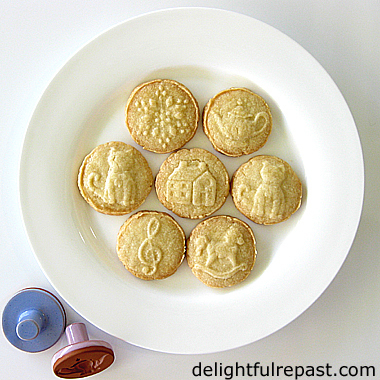 Stamped shortbread cookies are so much fun to make! Especially with the gorgeous designs of the family-owned Rycraft company. Established in 1968 (50 years ago) by the current owner’s parents, the self-described mom-and-pop company is now based in Idaho where the beautiful terra cotta cookie stamps are still handmade. Check out the Rycraft designs, more than 400 in this Heirloom Collection. I have nine, three I've had for ages and the six we're giving away here: Tea Time, Cat with a Bow, Snowflake, Home Sweet Home, Rocking Horse and Treble Clef. Whatever the occasion, holiday or season, whatever hobby or interest you have, there's sure to be a stamp for it! Today I used my basic shortbread recipe, and it worked beautifully. 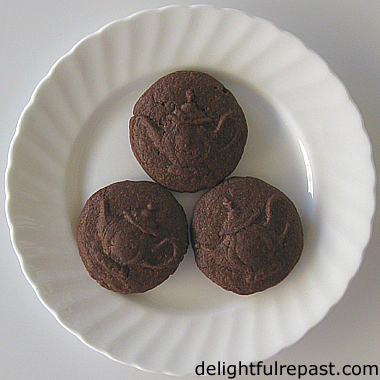 I’ve also made my Chocolate Shortbread as stamped cookies (above). I used a 2-teaspoon measuring spoon that day, but I decided this time to use a 1-tablespoon measuring spoon; and I think I like the larger amount better. 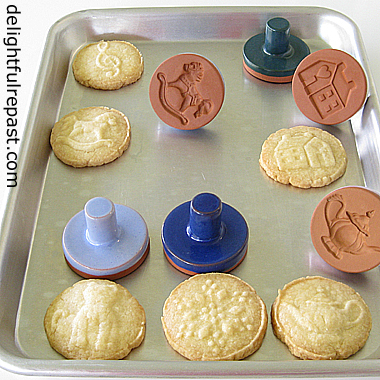 Have you used cookie stamps before? The stamped cookies do taste better, amiright? Enter the giveaway below and have fun looking at all the different Rycraft designs. Update 07/12/18: Just added another stamped (or not!) cookie, Ginger Snaps. 1 In 1.5-quart mixing bowl, by hand or with electric hand mixer on lowest speed, cream the butter, sugar, salt and vanilla extract just until smooth. 2 Add flour and mix well without beating a lot of air into it. If mixture is too dry to form a dough, mix in the teaspoon of water. 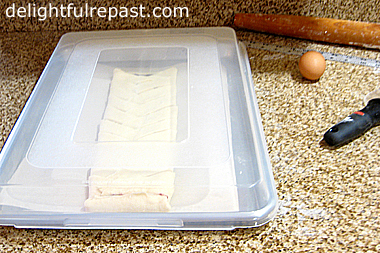 Wrap dough in plastic wrap, forming a 4-inch disk; refrigerate for 20 to 30 minutes. If you overchill the dough, it will be difficult to work with. 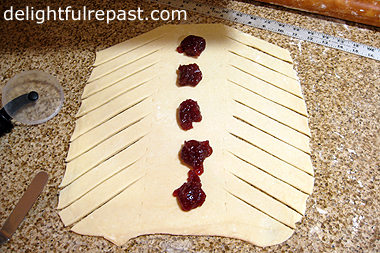 3 Using a measuring tablespoon, measure out level tablespoons of dough onto parchment-lined baking sheet. Roll the scoops into smooth balls. Cover and chill in the refrigerator for 15 minutes or so. This will make them easy to stamp, and the design will be very sharp. But if you overchill the dough balls, they will be difficult to stamp. 4 To stamp, with dough ball in the center of the stamp, press the stamp evenly till the dough reaches the edge of the stamp. Gently lift the stamp away. Repeat. My technique is to lift the stamp with the dough attached and gently peel away at the edge. This works very well with the chilled dough. If you find the dough balls getting too warm before you’re finished stamping, put the baking sheet back in the refrigerator for 15 minutes. 5 Cover and refrigerate for 30 minutes to 1 hour. About 15 minutes before you’d like to bake the cookies, preheat the oven to 325F/165C/Gas3. 6 Bake for 20 to 25 minutes, until quite firm and edges are starting to brown. Cool on baking sheet for 5 minutes. Then transfer to wire rack to cool completely. This giveaway is open to US residents* 18 years of age or older. Leave a comment below (one entry per person). Tell me the first stamp you'll use and for what occasion. Please include your email address in the body of your comment. Must enter by 11:59 p.m. Eastern time Wednesday June 27. * If you are outside the US but would like to have this sent to someone you know in the US (you would have to send them a gift card separately on your own), go ahead and enter! Also, Rycraft does ship internationally, so feel free to place an order wherever you are. Winner will be chosen by random drawing and be announced here in the comments before noon Eastern time on Thursday June 28. If I don't hear back from the winner of the random drawing by noon Eastern time Sunday July 1, another drawing will be held and a new winner selected from the original entrants (those who commented before the giveaway deadline). 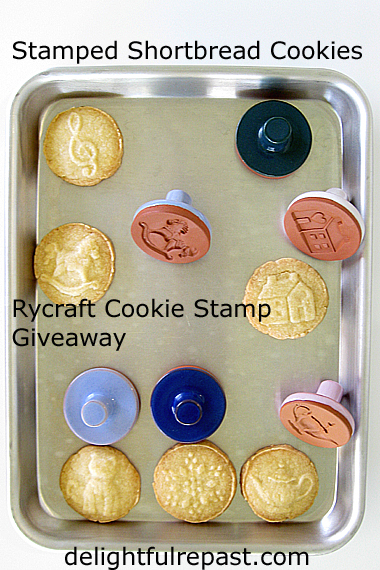 Disclosure: Rycraft provided a set of cookie stamps for review purposes and one set for the giveaway. The views expressed here are entirely my own. I always tell my readers what I really think! 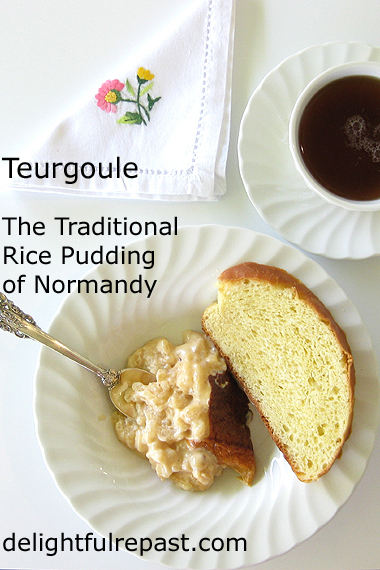 Since Teurgoule is a dessert traditionally served with Fallue, I got on it right away, while I still had a stash of Fallue in my freezer. If you were here last week for the Fallue, you’ll know that these two French recipes were introduced to me by Phil at As Strong As Soup. 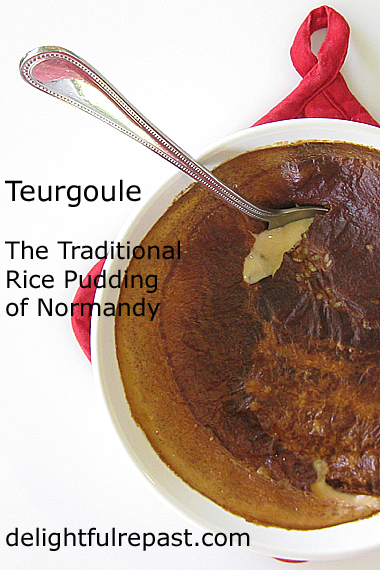 Teurgoule is a long-cooked rice pudding that is a specialty of Normandy. If I were in Normandy, I’d no doubt cook my Teurgoule in the special pottery made for the purpose in Calvados, Normandy. But, instead, I chose to try it in a Corning French White casserole. Arborio rice wasn’t specified, but it was the only short-grain white rice I had. Though just 2 tablespoons of cream would have brought my 2% milk up to the whole milk called for in Phil’s Teurgoule recipe, I doubled it because, well, cream. And Arborio rice cooks into a creamy texture anyway. I usually make stovetop rice pudding, and when I’ve made an oven version it has never been quite like this. Several hours in the oven! The idea is to get a really brown (leathery?) crust, or “skin,” on top and a slightly wobbly pudding underneath, since it thickens further as it cools. I've never seen a baked rice pudding recipe that didn't call for stirring at regular intervals, so I had to resist the urge. But I finally relaxed into a "we'll just see" attitude, and guess what? It was perfect. Clearly, stirring is not needed. Knowing I might regret not using the two different temperatures in Phil’s recipe, I settled on an in-between temperature I’d stick with for the whole time since I wasn’t going to be able to turn the oven down after 50 minutes, when I’d be in the middle of my workout. Can’t tell you the number of times I’ve had too much going on to heed a timer and turn the oven temperature down at some point. So whenever I can avoid that, I do. So I decided on 275F/135C/Gas1 and hoped for the best. Not sure the brotherhood would approve of that. Yes, there is a brotherhood! The Confrerie de la Teurgoule et de la Fallue de Normandie! 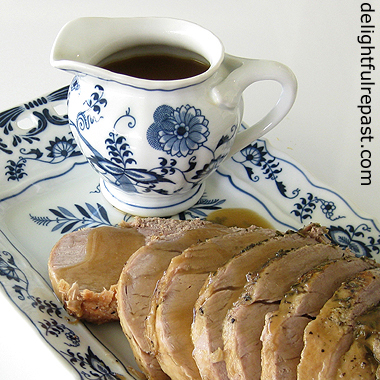 And I hope they don’t mind my having a cup of tea with my teurgoule et fallue. Because that’s just how I roll! 1 Preheat oven to 275F/135C/Gas1. 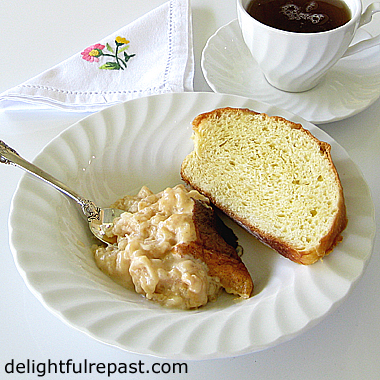 In buttered 1.5-quart round Corning French White casserole, mix rice, sugar, cinnamon and salt. 2 In 1-quart glass measure, stir cream into milk, then gently pour over the rice mixture, not disturbing it too much. Bake, uncovered, for 4* hours. * I had intended to cook it for 5 hours, but decided to take it out at 4 hours to ensure it not getting too thick. I like a consistency of somewhere between can use a spoon and must use a spoon, never must use a fork. I don't know what the Confrerie would say to that (my French is quite limited)! Might shorten the time to 3 1/2 hours next time to have the pudding less solid after chilling. 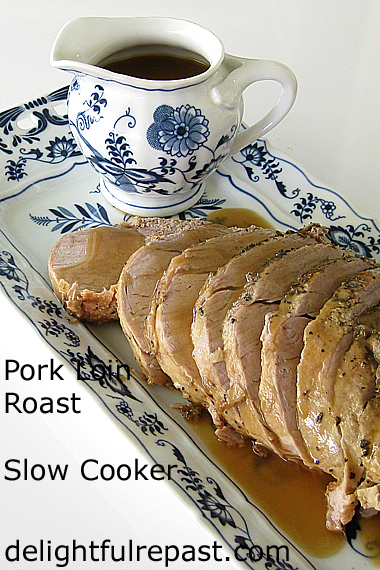 3 Allow to cool at least 30 minutes before serving. Even longer if you prefer it at room temperature. It's also good cold. Whatever you like. Keeps, covered, in refrigerator for up to 3 days.